What are the pros and cons of each of these different display adapters and cables? From what I can understand, HDMI offers the ability to send audio along the same cable as well as the ability to do progressive scan. I've Googled but I can't seem to find any real answers. Why would someone care to run 1280x1024 over HDMI or DVI instead of VGA? What about component? All I hear is one is digital and one is analog, but I can't find what that means from a feature/benefit stand point. The nice thing about Digital (HDMI and DVI) is that it is noise tolerant. On an analog line, to get a perfect picture the voltage at the receiver would need to match the voltage at the sender. Noise can get in there and distort the signal. On a digital line, the receiver simply needs to determine if the signal is a 1 or a 0 (high voltage or low voltage). Because of the noise tolerance in a digital signal, you can buy cheap cable and it will work just as well as the expensive stuff (don't listen to the "Pros" that try and sell you the expensive stuff). You can also run the signal over a long distance without introducing a lot of noise. There are currently four common ways to connect displays to video cards. Depending on what ports your video card has and what inputs your monitor has, choose whichever one you have available or will work the best for your needs. VGA (video graphics array) has been around the longest. VGA is an analog signal, meaning the quality may not be as high as with other cables, especially at high resolutions. DVI (digital video interface) has been on graphics cards for many years now, but is still very common. Almost all LCD displays have a DVI port. Because DVI is a digital connection, the signal will be higher quality than VGA. 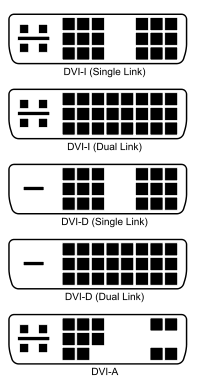 There are several different types of DVI connectors. They're mostly intercompatible, but not always. DVI-A carries only an analog signal (and is therefore rarely useful). DVI-D carries only a digital signal. DVI-I carries both, and can be used with DVI-VGA adapters. 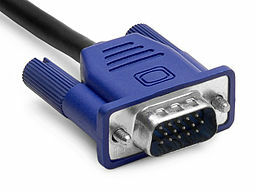 DVI-I connectors are the most versatile, as they can be used for either digital or analog signals as necessary. There are also two link modes. Almost all DVI cables are single-link, which supports a practical resolution of up to 1920x1200. Dual-link cables can support resolutions up to 2560x1600, and are typically only used for very high resolution displays. Most (but not all) graphics cards with a DVI output do support dual-link DVI. You can verify which type of DVI your GPU, monitor, or cable supports by checking the pins. HDMI (high definition media interface) is a newer port, but is 100% compatible with digital DVI signals. You can get cheap DVI->HDMI and HDMI->DVI cables and adapters (not converters, because there's nothing to convert). HDMI has the advantage of being able to carry an audio signal, but this only works if your card supports outputting HDMI audio and your monitor has built-in speakers can can receive audio over HDMI. In 2009, HDMI 1.4 and subsequently 1.4a were introduced, with some significant changes from previous versions. These cables are backwards compatible, but add new features such as improved support for 3D displays, higher resolutions, and Ethernet over HDMI to allow for network connectivity on display devices. Most of these features will not affect the typical user, particularly when connected to a computer monitor, but are worth noting. DisplayPort is the newest connector. Typically only newer and high-end monitors tend to have DisplayPort. It's typically best to only use DisplayPort if both your monitor and graphics card support it, or if you have more than 2 monitors. If you have more than 2 displays, ATI graphics cards require that you use DisplayPort connectors for the third and any additional monitors. 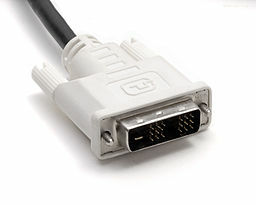 There are converters from DP to DVI, VGA, and other connectors, but they are sometimes less stable than a regular cable connection. To convert DisplayPort to DVI or VGA at resolutions above 1920x1200, you need an active converter, which are typically very expensive and require an external power source as well. 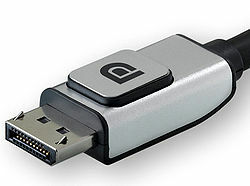 Mini DisplayPort is electronically identical to DisplayPort, but has a smaller connector. It is common on higher end laptops, and is also found on some video cards. Mini DP has the same caveats as normal DisplayPort. Adapters for DisplayPort and Mini DP are not compatible, because of the size difference. Depending on what connectors you have on your card and monitor and what you need to do, you can decide which of these will work best for your situation. VGA is the only analog video connector in common use. An analog video signal is typically sent in three components: red, green, and blue (RGB). The color information is sent as a fluctuating electrical current, and the image quality can be degraded if the signal gets disrupted in some way, such as by interference. This is why with analog cables, the quality of the cable can actually affect the quality of the signal. In analog video cables, the information being transmitted corresponds to actual light values for the monitor to show. Digital signals, which include HDMI, DVI and DisplayPort, send data as a stream of 1's and 0's represented by pulses of electricity. Rather than having a variable current, only a high and low voltage are sent, corresponding to the binary bits. Interference is less of a concern. Analog cables can theoretically carry information for an infinite resolution, while digital signals are limited by their bandwidth. However, this is rarely ever a problem, and the advantages of digital cables tend to outweigh this possible detriment. About the whole digital vs analog thing, here's an anecdote to explain. My monitor once had this nasty pinkish/purplish tone over the entire image, which turned out to be a result of the VGA (analog) cable behind it not being secured properly. A digital cable like HDMI or DVI would be able to bypass this problem, because the 1s and 0s are either there or not, perfectly or not. There can be no semi-working purple mode. I'm going to add extra information about Display port, especially considering the fact that AMD's Eyefinity puts this technology front and center. It basically takes one desktop and scales it to multiple screens. So if the 3x1 Landscape on the top left is three 1920 monitors, then it would show a single Windows desktop with a resolution of 5760x1200. Now to achieve this, you'll need to use Display Port. Display Port is a very different technology from DVI/VGA/HDMI. For one, the Display port has more theoretical bandwitdth. It uses a packet architecture not unlike USB or Ethernet. HDMI/DVI and VGA are more like sound speakers or IDE parallel ports. The three color signal wire pairs run parallel with a clock circuit on the fourth pair. DisplayPort's architecture theoretically allows for far greater potential distances. The DP components also cost less and also requires less voltage ( 3V vs 5V)), and thus theoretically allow Display port only displays to be thinner than displays with HDMI. By far the most confusion part of Display Port is the initial confusion about Active and Passive Display Port Dongles. This was most noticable when Eyefinity first came out. To use Eyefinity, you need at least one display using Displayport . . .
Well if you hook up a dongle to the Display Port on the AMD card, then two monitors on the DVI ports, then you should get Eyefinity right?? There are two ways for a video card to push a HDMI/DVI signal over display port. The first is what is called an active converter. The video card take the HDMI/DVI and encapsulates the signal using Display Port. When the Active dongle receives the signal, it then sends the HDMI/DVI signal to the monitor. You can run a Display Port monitor AND an HDMI signal off that same dongle, along with audio and USB (theoretically). The second method is to use a passive dongle. There is no chip here. The graphics card detects them as and outputs a HDMI/DVI signal over Display Port. The passive dongle then just clocks it up to the HDMI specs. The problem here is that the video cards capable of Eyefinity only have two "pipelines" that can push out the older HDMI/DVI signals. Thus if you use a passive dongle, you are really sharing that pipeline with three monitors. For Eyefinity to work, it needs more bandwidth (remember 3x1920 monitors is 5760 across!). Thus that is who one of the three monitors has to be powered using the Display Port "pipeline" (the quotes are because I have no idea what the real name is or what the heck they exactly do). HDMI and DVI are the same as far as video is concerned. You can switch between them with a $2 adapter. Both of these are digital formats. VGA and component are analog formats. While this is fine for driving a CRT, there is a definite quality loss when connecting to an LCD, since there is a conversion from digital in the video card to analog on the cable, and back to digital at the LCD. It's largely an issue of what your input and output devices support. For example, I have a dual-DVI video card, and an HDMI HDTV (via receiver), and DVI-capable monitor. So I have a DVI->HDMI cable for the TV and DVI to the monitor. HDMI, as it can pass audio, lets you consolidate cable clutter if your PC has HDMI-capable sound output. Laptops with HDMI out generally support this, for example. VGA is simply not included in a lot of recent devices. My TV does have a VGA input, but I use HDMI from the receiver for sound output reasons. yes HDMI and DVI is digital and VGA/Component is analog. If connecting a PC to a LCD monitor (or TV) via an analog cable, the picture information will get converted from digital(PC) to analog(cable(s)) and back again to digital(LCD). Conversion adds noise (depends how good the A/D and D/A converters are, gfx-card (D/A) and lcd screen (A/D)). Had one avoided the conversions (using DVI or HDMI) there would have been no unneeded A/D / D/A conversions, and the signals would never left digital form (which is very unsensitive to noise). More noise in the analog signals get picture more blurred. And the digial signals makes a very sharp picture. Also, remember that many DVI ports also carry an analogue copy of the screen image in some of the extra pins. This is why DVI->VGA adaptors work - they simply carry these pins (that a DVI device would ignore) to a VGA style connector. Not the answer you're looking for? Browse other questions tagged hdmi dvi vga displayport community-faq or ask your own question. Is a DVI to VGA adapter reversible? When buying a KVM switch to use with a Mac Mini, what should I look for? How would HDMI help me if the PC is not used to watch movies or play games? Does the Lenovo T60p vga port support an S-video signal? Are HDMI to VGA Adapters Really Device-Specific? What display cables and adapters should I use to connect a second monitor to GTX670? How to use the VGA/DVI/HDMI backward campatibility feature of DisplayPort? Why are HDMI to VGA with audio adapters common, while HDMI to DVI with audio not? How does HDMI-to-RCA cables without converters work?